Diggers Valley: 15 September 2012. The week beginning the 15th of September 2012. It was showery in the morning, then increasingly wet, which made Stephan's preparations for a trip to Auckland a bit unpleasant. He's off to renovate a bathroom for some of the family and I shall be alone for several days. Unbelievably, I shall also have to cook my own dinner! This lack of preparation is unheard of. I wonder if a possum body could decompose this much in two weeks? If so it may be one Nick shot when he was here on his hunting visit. 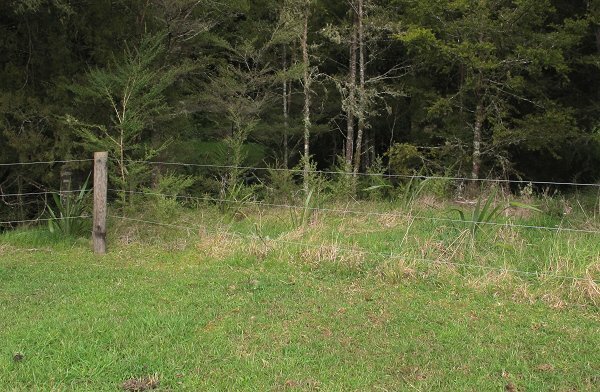 He said he'd shot a few possums which didn't immediately fall out of their trees, despite their obvious demise. 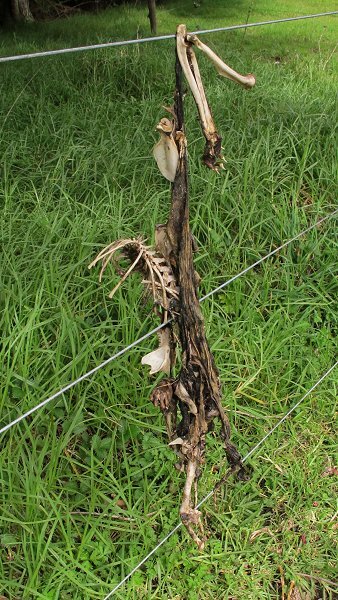 This body must have fallen from the tree above and caught on the fence on its way down. The cows were in the Big Back Paddock only 12 days ago, but there's been some growth and it's a big area, so here they are again. Turning to the left from the picture above, I noticed the flax plants on the other side of the fence. We planted them out here ages ago, but it's taken a while for them to become big enough to see amongst the grasses. Some reasonably serious-looking clouds were gathering as I was heading home and just after I'd stepped inside the house, the rain pelted down and continued to do so for the next hour and a half. Only 20mm fell, but that much in such a short time brought the rivers up quite quickly and I worried about the sheep in the Pig Paddock, having only just moved them there this morning. Ivy 73, also known as Squiggles, has an udder which always appears to have filled more than I expect as she approaches calving. She's doing it again this year and I fear being caught out if I ignore it, because it's hard to assess how quickly it's happening and whether or not it's meaningful. I went out to check them this morning on the hill Over the Road and there she was, standing near the gate, so I decided I'd take the opportunity and bring her across the road. 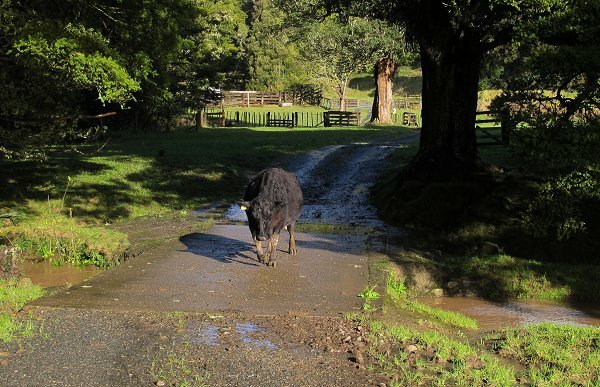 I wouldn't normally do this on my own, but Squiggles is a cow who is generally quite willing to obey directions and on a Sunday there's little traffic on the road. I let her out through the gate, shut it again before the others followed and then we waited while a vehicle passed, before I shooed her over the road and shut the main gate behind her. Wondering how she'd behave, I walked ahead, calling her to follow me and to my immense delight, she did so, without a single look back to the herd-mates she was leaving. I thought she might baulk at the bridge, because the water was quite high, but after a bit of a sideways look, she walked quickly over and continued following me. Later in the afternoon I put her in with the other four (expected) early calvers. 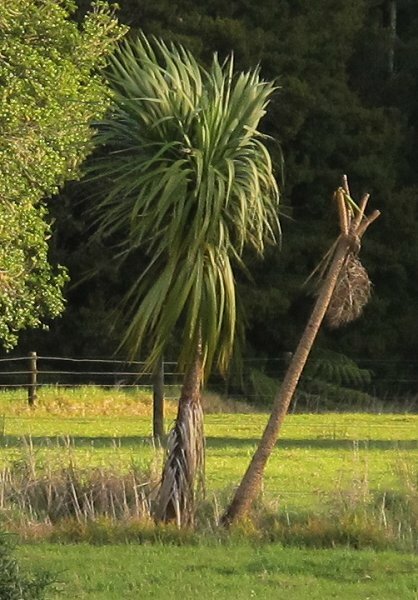 On the edge of the drain between Flats 1 & 2 is this Cabbage Tree - or is it two of them? The dead bit went from green to yellow as its leaves dropped off, over a fairly short period. I presume they're actually two trees, or surely the other half would have succumbed to this Sudden Decline, as it is formally known, as well? There's a lot of water still lying around after this afternoon's heavy rain. 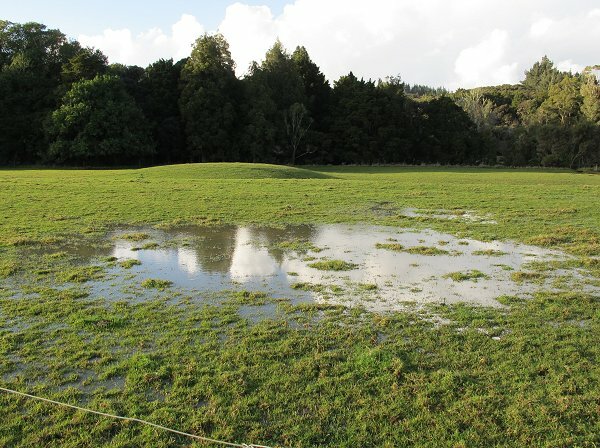 These big dumps of water don't help the ground conditions! 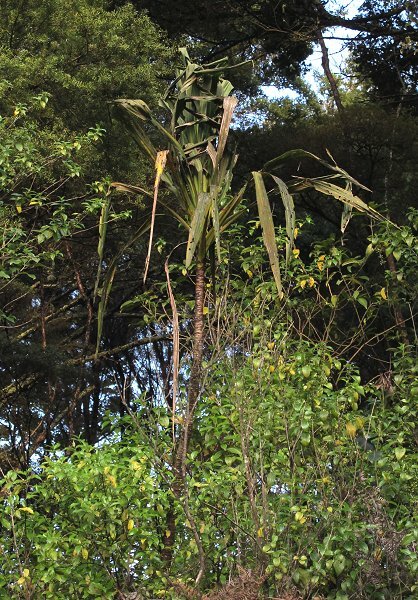 I don't think I've noticed this Forest Cabbage Tree before, growing on the side of the road on the boundary of our Over The Road paddock. I presume its appearance is due to having been hit by frost? 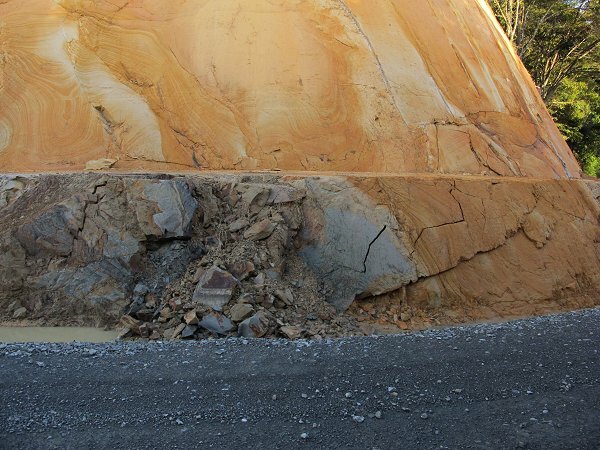 The corner cutting is beginning to show cracks and some slumping. The material which has fallen down is now blocking the drain around the bottom, so the water can't run round to the culvert. I think a call to the Council may be in order, to send someone with a shovel to do a bit of maintenance. My back hurts just thinking about doing it myself. Besides which, I might get run over on the busy road. 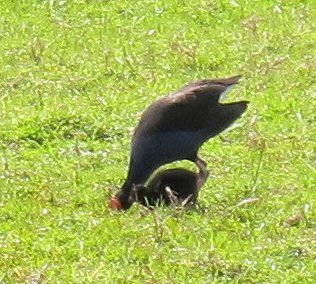 Pukeko are great parents. They feed their young, teach them to feed themselves, and protect them fiercely. The day after I took this picture I heard a commotion outside and watched the adults seeing off a stoat which has probably already eaten two of the chicks, there now only being three of the five left. Pukeko are capable of killing other animals, but it would seem stoats are a step higher up the predatory ladder then they. This was a chance picture: I was photographing something I couldn't see clearly with my failing eyesight, away in the distance - I take the picture then enlarge it on the camera's screen so I can see it more clearly. 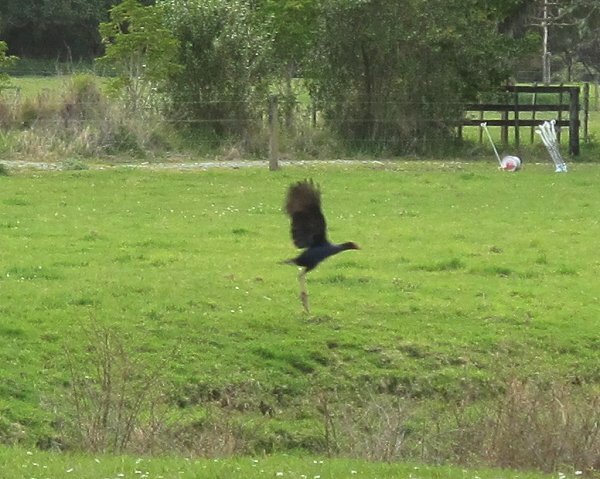 Lots of people don't know Pukeko fly. As I have written often in here, they fly well enough; they just don't land very elegantly. They also need to get a bit of height and speed up before they lift their legs up behind them to form a more aerodynamic shape. This one's for Stephan, really, to prove that I am capable of feeding myself, although I'm in two minds about demonstrating that fact, because I fear he may then decide that I should do so more often. I can cook very well, but I prefer to do other things. Having not prepared dinner for myself for some time, I made far too much. The next and following nights I worked out that 42g of spaghetti was exactly the right amount and the easiest way to get the right amount was just to weigh it. I'll share more of my cooking-for-one tips another year. 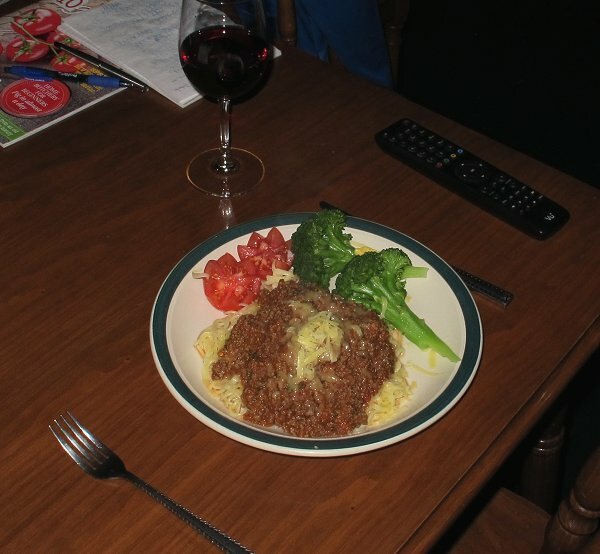 I ate the same thing six nights in a row, because otherwise I'd have had to cook, again! I can't believe this area. 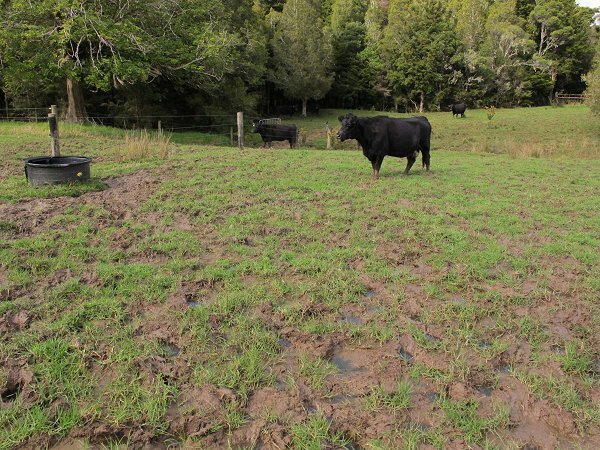 Like many of the flat bits at the bottom of slopes, the ground has turned to slush, with the repeated footfalls of the cattle and so much rain. I know though, that come summertime, it'll look like this again. 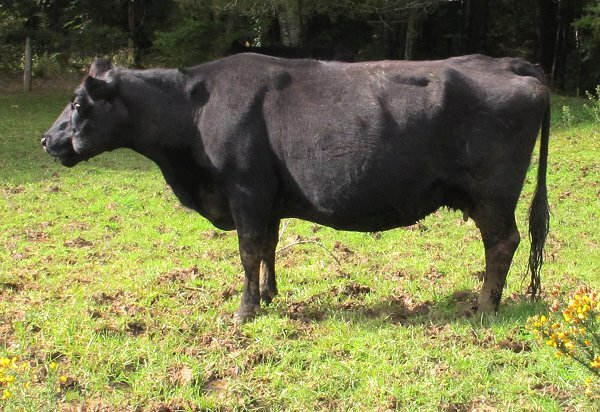 Monitor cow, 475, looking thinner than I would like. Last year she was a much smoother form. What this probably means is that on average the cows are in lighter condition than last season. They'll get through alright, they always do, but I have tried hard to ensure there's enough feed through the winter for them to do better than this. There are 28 cows in the mob, but only 27 had appeared. Counting them is always a bit of a mission, because they stand behind trees or each other and it's easy to miscount, so I always mark everyone off on my attendance register. 548 wasn't there. I walked up to one of the high points and called. 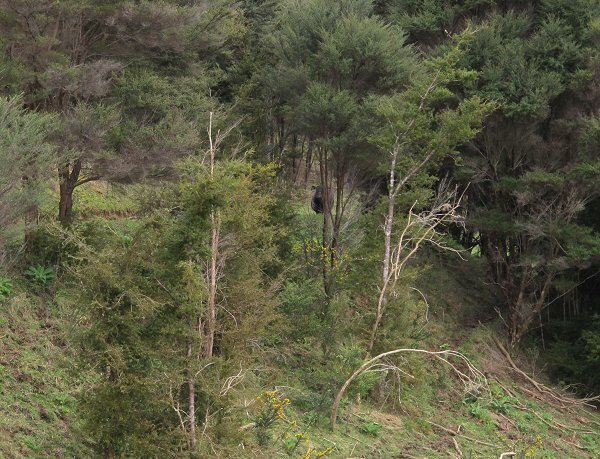 At one point I heard a noise so I waited for a while longer and eventually saw a moving dark shape away down in the trees. 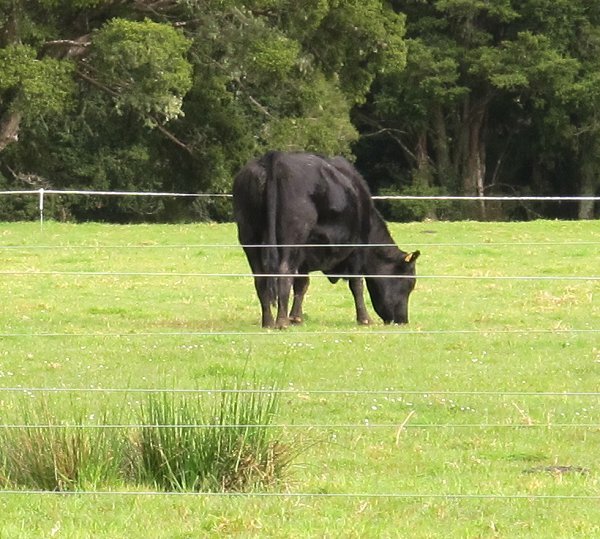 It's always such a relief when a lone lost cow appears. 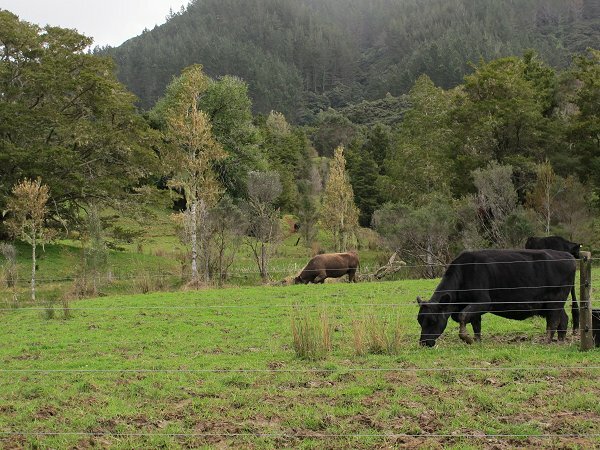 It's a big paddock, so it's possible that a cow has her head down, grazing away from anyone else, and fails to hear my calls or notice that everyone else is leaving. 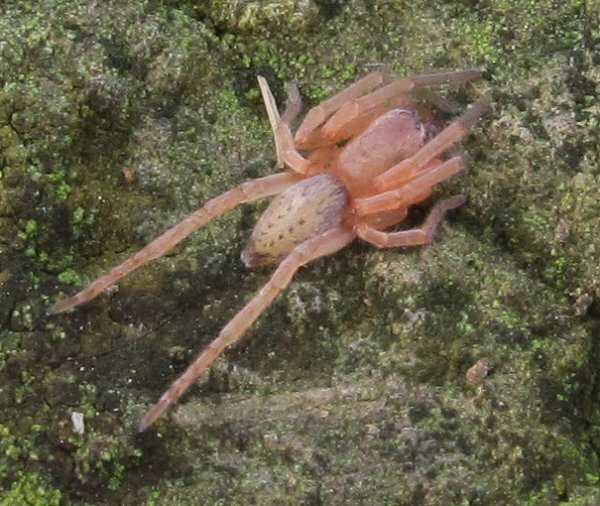 Are spiders still scary when they're such a pretty colour? This one was only the size of a slater (wood-louse) which was also on the top of this post when I retrieved the cow brush I'd left sitting there the other day. 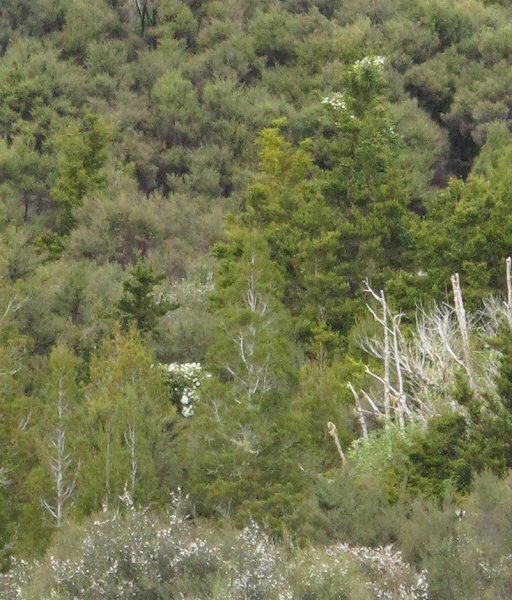 The Clematis flowers are out up in the bush at the tops of their host trees. The frothy white flowers at the front are Manuka. 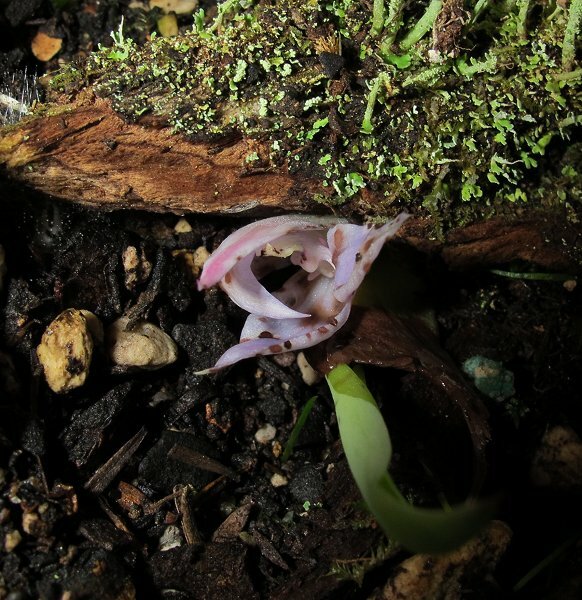 In my electric-taped orchid reserve many of the plants have grown to a respectable size this year, and their flower spikes are beginning to emerge. I hope I get the opportunity to see the flowers. We need a fine, warm, sunny November! When I first looked out the window this morning, heifer 660 was stamping her feet and swishing her tail: obviously in labour. I decided I had time to have breakfast before going out to check on her and, keeping an eye on her through binoculars from the house, I could see feet without a bag over them, so figured things would go alright without my presence if she was quicker than expected. But like most heifers things were progressing at a very moderate speed. 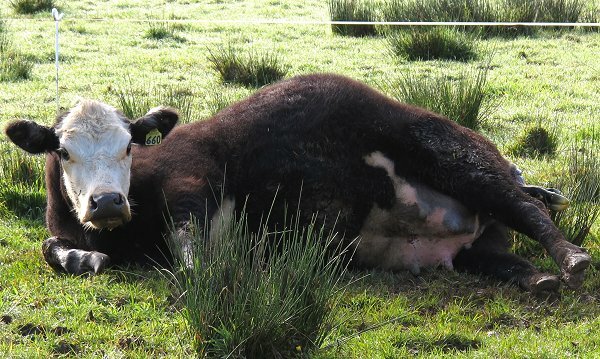 If you look closely, the calf's nose and tongue are visible above its legs. She seemed to be making heavy work of it all, but I think it was only my perception, having arrived part-way through the process. Once the head was on its way through the cervix, the birth progressed quite quickly. 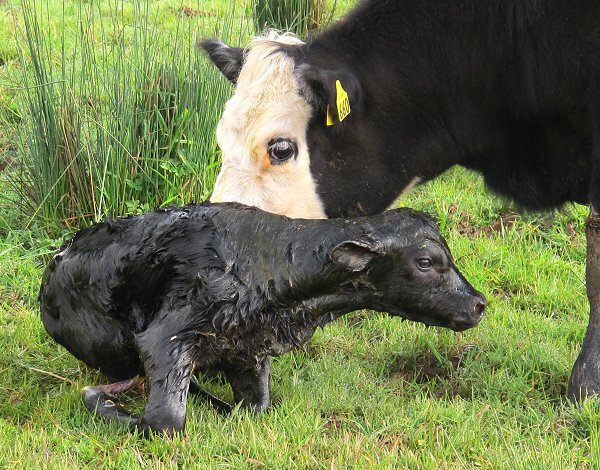 It's always nice to see the first heifer's calf successfully and easily born. This is the first year I've used #90 as a sire over the young heifers. 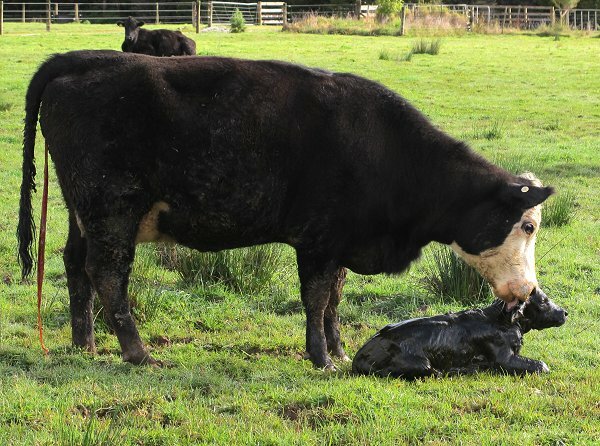 I'd first seen 660 at 7.40 and the calf was born at 8.36. She started trying to get up at 8.40! They're so quick. 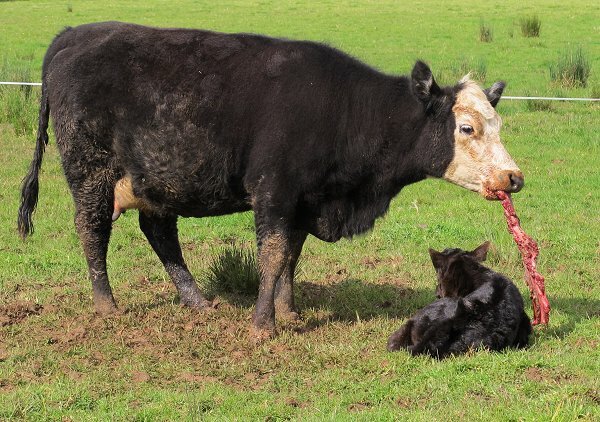 Athena 72 has caused trouble in the last couple of years, trying to steal other cows' calves as soon as they're born. I deliberately got her in calf earlier than the others so I could manage that problem better this year; but because her gestation period is longish, 660 beat her to first place. Fortunately I had decided to draft Athena out of the little mob last evening and she now has Zella for company, who isn't due to calve until early November. This morning Athena seemed quite calm when the new calf was born and after watching for a few minutes, went off and continued quietly grazing. I did see her later on though, looking very intently at the calf, so I'm still not prepared to risk having her around the others. I took this picture at 8.52, as I headed home. 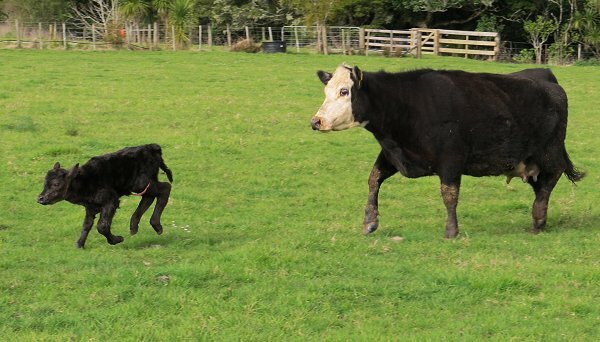 It's always good to see calves get up and mobile so quickly. 660 had been munching away on her afterbirth for an hour and ten minutes when I took this picture. She'd swallow it down, then cough it up again. The task was distracting her from the calf and as I hadn't seen the calf feed, despite keeping a careful watch over them all day, I took the afterbirth away. Some cows eat it very efficiently, some leave it entirely and others make real meal of it, but I'm not sure it does them any good to expend so much energy in the process. The calf was quite energetic in the afternoon, skipping around and running around the paddock, but I was not convinced she'd had her first feed yet and worried until I watched her feed just before dark. 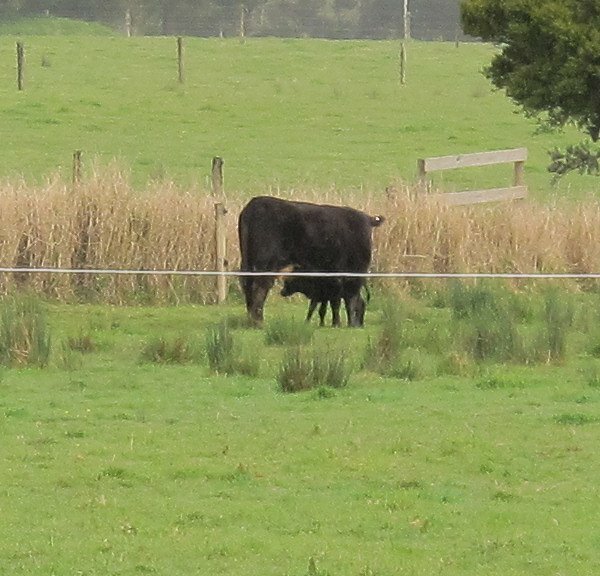 The little pink bit swinging out from the calf's belly is her umbilical cord. I think this is a mutant orchid. 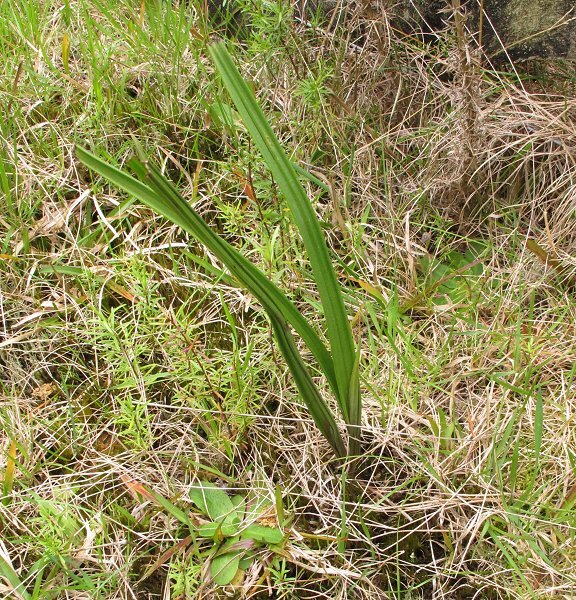 It could be of the plant which is growing here, a sun orchid, even though they don't flower until November. Something's gone wrong in its life! 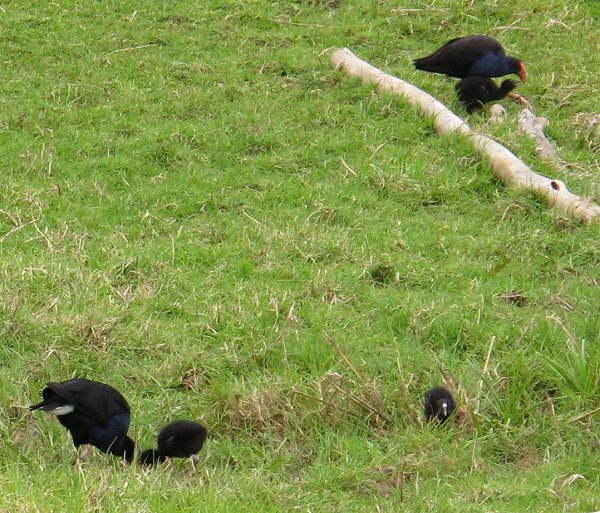 The Pukeko chicks still number three, despite repeated attempts on their lives by passing hawks and I presume the resident stoat would happily have them for seconds, having probably eaten two of their siblings. 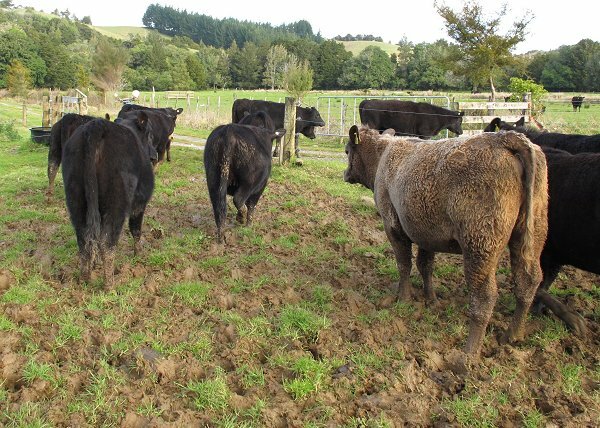 The yearlings are going to have to play second fiddle to the cows for a few weeks, as the cows' feed needs in late pregnancy markedly increase. The heifers are all still in excellent condition and appear to have grown well. I haven't weighed them for a while and look forward to doing so.